We continuing with our British Food Fortnight recipes, and our next one is from www.ukshallot.com. 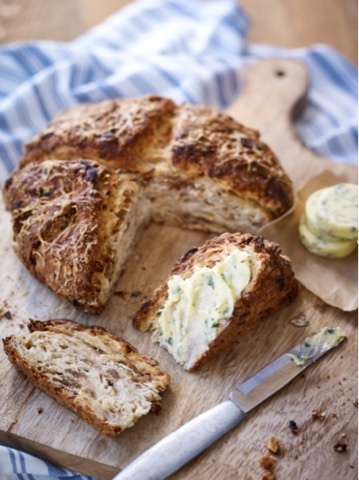 This caramelised shallot soda bread looks amazing - just looking at the photo is making me hungry! I bet it smells lovely when it's warm - you can't beat the smell of freshly baked bread! Make a well in the centre of the flour and pour in the buttermilk. Splay your fingers out like a big fork and mix gently but quickly to combine to a dough. To get the lightest bread, minimise the amount you handle the dough. Turn the dough out onto a floured surface and pat into a circle. Transfer to a non-stick baking sheet and pat down a little. Scatter with the remaining cheese and cut a large cross, deep into the dough and bake for 40-45 mins until the bottom sounds hollow when tapped.